Twenty-five years after the Lebanese civil-war, its wounds linger. In today’s Beirut, a small incident between a Palestinian refugee, Yasser (Kamel al-Basha), and a Lebanese-Christian, Tony, turns into a complicated trial, in which the personal becomes political. Competing narratives and mutual accusations of that war are laid out to show, as one lawyer states, ““no one has a monopoly on suffering.” Kamel El Basha is a Palestinian actor from al-Quds (Jerusalem). He has had an impressive career in theatre, including serving as artistic director of the Palestinian National Theatre, as well as a film actor. 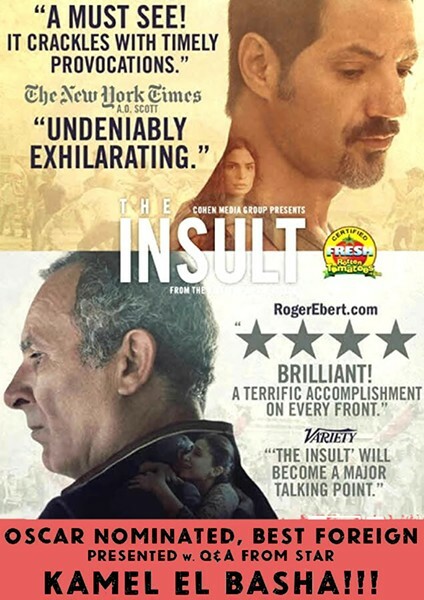 His performance in The Insult won him the award for Best Actor at the Venice Film Festival.